Newport – Volunteers of America, Knoxville has announced that it has received a grant of $300,000 from the U.S. Department of Labor to help homeless female veterans and veterans with families in Cocke County and other East Tennessee counties. Mary Dodson, case manager for the veterans, said the Homeless Female Veterans and Veterans With Families (HFVVMF) was received in September. Volunteers of America, Knoxville has announced a $300,000 grant to help homeless female veterans and veterans with families in Cocke County and other East Tennessee counties. 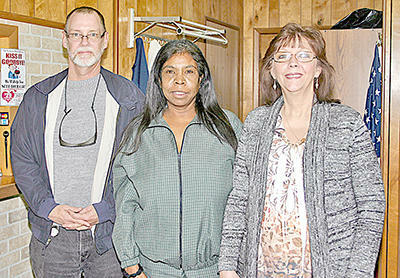 From left are, Program Manager Byron Dickerson, Case Manager Mary Dodson, and Case Manager Debbie Dotson. “Female veterans are the main focus of our new grant because they see, to be underrepresented as far as reaching out and seeking assistance,” Dodson said. Dodson said six percent of U.S. Armed Services veterans are women. She described the grant as covering 21 counties, from south of Knox County and all points east in Tennessee, including Johnson City in Washington County. Dodson said it is a “back to work” grant to help veterans return to employment. She said some of the barriers that veterans’ families face including no housing stability; some veterans are staying on the couches of acquaintances, in a motel, or in their vehicles. Volunteers of America, Knoxville, will help veterans with some of their needs, such as job interview clothes, paying for vehicle problems, work clothes (such as the mandatory purchasing of work uniforms), and paying for childcare. “We connect that family to resources available to them,” Dodson stated. Byron Dickerson is the program manager for HFVVWF. In addition to helping a veteran get a job, Dickerson said there are people available to “stay with them to be sure they’re stable”, for up to 270 consecutive work days (nine months). Dickerson also said of the “homeless” classification, “If you don’t have a lease or mortgage in your name, you’re homeless.” If they have a lease, but facing eviction, they can be helped. Two other grants provide services to veterans, as well, including the Homeless Veterans Reintegration Project (HVRP) and Supportive Services for Veteran Families (SSVF). The grants overseers say that, for purposes of receiving assistance, a veteran is eligible if he or she serves only one day in the military. Reserves and National Guard are eligible, too. Only those with dishonorable discharges are prohibited from receiving assistance from the grants. Debbie Dotson is case manager of SSVF. The purpose of the grant is to “promote stability among very low income veteran families who reside in, or are transitioning to, permanent housing,” according to literature. The SSVF Knoxville contact information is Carla Y. Kimble, LMSW program manager, CarlaK@voatn.org. Dickerson and Dodson can be reached at (865) 524-3926 ext. 235, or by email: bdickerson@voatn.net and MaryD@voaky.org. Their office is 511 North Broadway, in Knoxville. The general email address is www.voatn.org. Veterans eligible for assistance can be literally homeless, imminently homeless, or couch homeless (living with friends or family). The program manager for HVRP is Clyde Vincent, LBSW, (865) 546-4813, (ClydeV@voatn.org). Dickerson said that Volunteers of America’s headquarters is in Louisville, Kentucky. He said other areas that VOA works in includes people with addictions, AIDS, the elderly, different disabilities, and abusive situations.